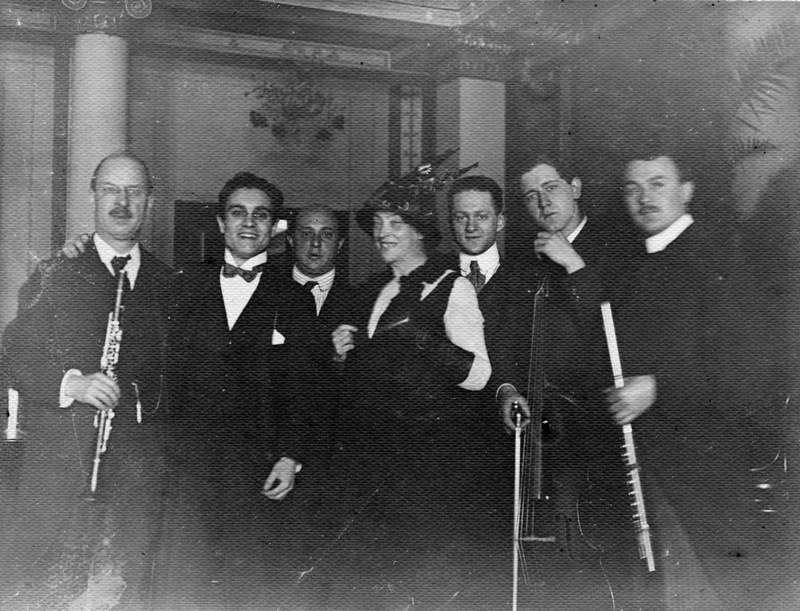 Schoenberg and the performers after the first night of Pierrot Lunaire in Berlin in 1912. On Sunday 12 February 2017 at Conway Hall at 6.30pm, there is a lovely concert where Louise Kemény (soprano), Adrienn Kantor (flute), Alena Lugovkina (flute), Joe Shiner (clarinet), Alice Eddie (clarinet), Jamie Campbell (violin), Sarah Sew (violin), Bryony Mycroft (viola), and Sophie Gledhill (cello) will be performing Schoenberg's String quartet no. 2 and Pierrot Lunaire plus songs by Stravinsky, Copland and Ravel. Before hand, at 5.30pm, I will be giving a pre-concert talk entitled Ich fühle luft von anderem planeten, when I will be talking about the works in the programme and looking at the influence of Schoenberg's Pierrot Lunaire on Ravel and Stravinsky.